Have you enjoyed playing workouts in the newly updated Workout Trainer app? Ready to start creating your own workouts with your favorite exercises? Below are some tips on how to create custom workouts using our latest features! 1. Select the ‘+’ icon to begin creating a workout. You can find the ‘+’ icon on the home screen and in the workouts tab. 2. Add exercises to your workout set. You can choose exercises by typing in the search bar, browsing by muscle group or equipment and by looking through popular exercises. If you don’t find what you are looking for, you can add a new exercise! 3. You can choose how you want each exercise performed by customizing the playback options. Depending on the exercise, you can set it to be completed for a duration OR for a target number of reps. You can even select reps until failure! Additional optional details can be included, such as load type and level, as well as target effort level. Check out the ‘info’ icon on this screen in the app for examples of how to use these variables. 4. Finalize your exercises. After you have built your set of exercises you can easily remove, swap, edit playback options, duplicate and re-order exercises. 5. Finalize your workout. Make any last adjustments to your sets. You can edit the number of times a set is to be completed (this is the ’rounds’), duplicate a set, remove a set and re-order the sets. One more thing, if you are a Trainer or Pro you can even personalize your workouts with your own instructional exercise photos! Start exploring our advanced workout creation features in the latest WORKOUT TRAINER app for Android & Apple devices. We’d love to see what kind of workouts you love to do and share! Last week, we released our latest Workout Trainer app update. This BIG update includes a redesigned workout player, giving you an enhanced playback experience. Keep reading for some great tips on how to make the most of the new Workout Trainer player features and functionality. 1. 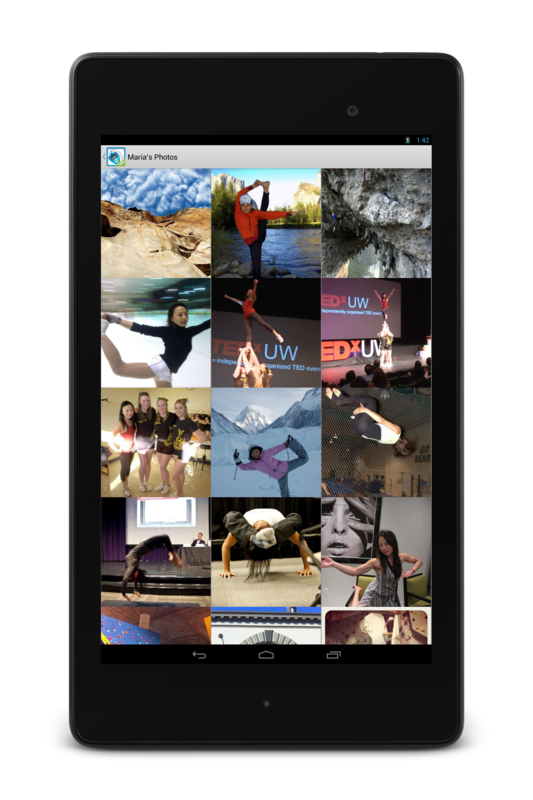 Tap the arrow icon in the top left corner of the blue progress pane to minimize the exercise video and pictures. To return back to the default view, simply tap on the current video or photo. 2. See exercise instruction text by tapping the info icon in the top right of the blue progress pane. 3. Rep-based exercises can be completed at your own pace. When you are done with your reps, use the red ‘TAP DONE’ button to progress to the next exercise. Remember to get the latest version of Workout Trainer to get this enhanced playback experience. 4. Time-based exercises will automatically progress to the next exercise when the time is completed. 5. You can pause your workout by tapping anywhere on the screen. On iOS devices, you can access your music and modify other playback settings, like expert audio mode and turning video off, by tapping the icons in the top right. Android users can modify their playback options in Settings. Start exploring our new playback functionality by getting the latest WORKOUT TRAINER app update on all your Android & Apple devices today! Attention (Android) Skimblers: After much anticipation, we’re excited to give you the first scoop on our latest app update! Not only did we completely revamp the overall look of Workout Trainer, but we’ve added some slick features that make it easier for you to stay on track with your fitness goals. We invite you to check out all of our new features by downloading the update in the Google Play Store. ✓ Do the new fitness assessment so we can customize your experience. ✓ New dashboard with more targeted, recommended, and featured workouts. ✓ Set your Weekly Workout Goal to stay on track and be consistent. As we mentioned earlier, you can auto-sync with Smasung’s S Health app on Galaxy S5 and other devices like the Note 3 for complete tracking of your fitness progress across apps. We told you about our exciting partnership with Samsung a little earlier, and we’re happy to announce that the Samsung S5 is now on the market! New Workout Trainer users can take advantage of a complimentary 6 month Pro+ subscription free trial (valued at over $40 USD), which unlocks additional features including HD exercises, premium audio coaching assistance, an all access pass to custom training programs, and Pro-only community forums led by certified personal trainers. 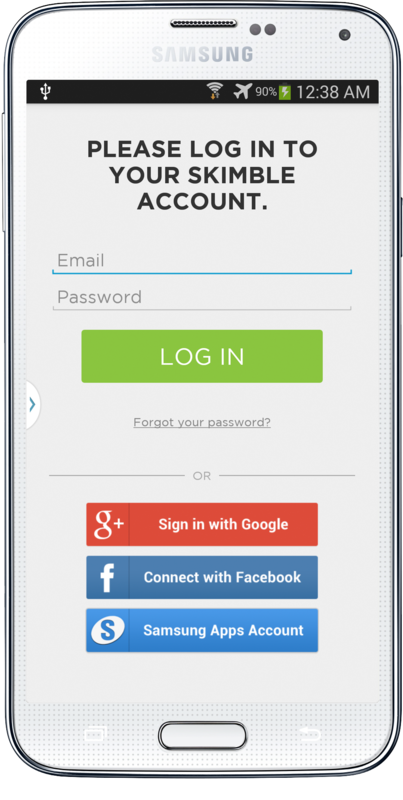 Be sure to sign up for Workout Trainer with your Samsung Account on their S5. If you need assistance, feel free to reach us at support at skimble dot com. 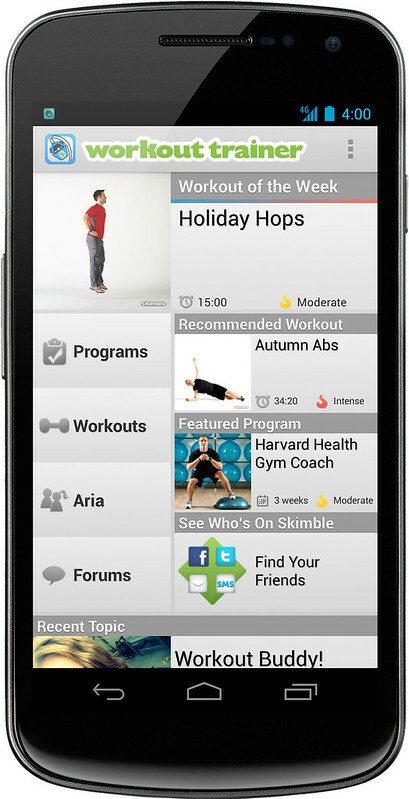 Download the updated Workout Trainer app today in the Google Play store and get your workout ON! Stay connected with our Community Forums and let us know what you think about the latest update. We think the new updates will really keep the psych high as you work to conquer at your fitness goals and wow your friends with your healthy and fit look. 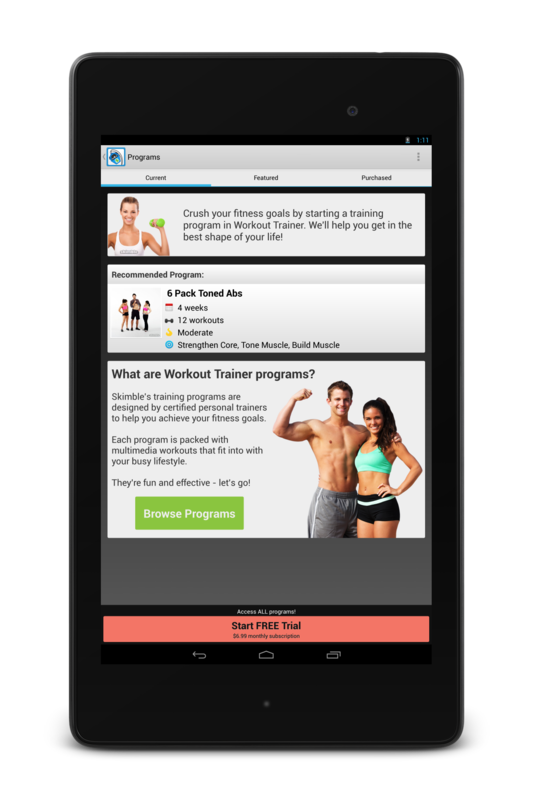 Download of update Workout Trainer (version 4.5) today in the Google Play store! 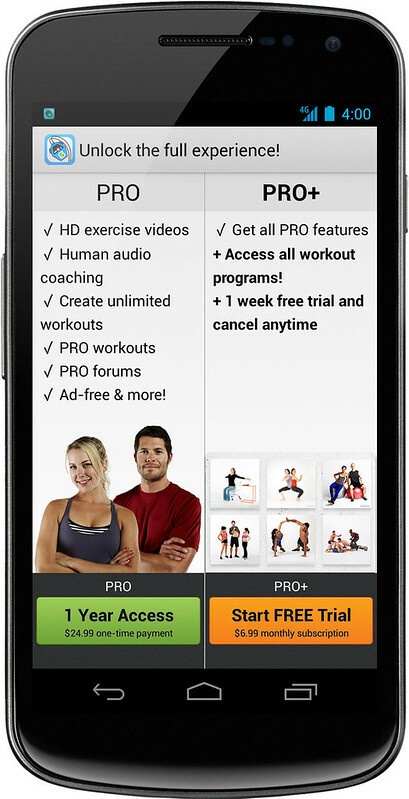 Get the Workout Trainer Android update: free videos and PRO+ membership trial! Hey Android Skimblers, we’ve got a holiday treat for you! Do you love exercising along with our global trainers? Want to see them come alive with video? Our latest Workout Trainer app update for Android now provides you with a complimentary video experience for our Workout of the Week challenges! For the WoW, you can sample our Pro audio coaching as well. Try it today with our latest Workout of the Week, Holiday Hops! Curious about what else you can get with our premium offering within the free app? Now you can now get a 7-day FREE trial of our new PRO+ membership. PRO+ provides members with all our PRO features & workout programs! Think of it as an all-you-can-exercise package. If you like using PRO+, then enjoy it for $6.99/month going forward. You can cancel at any time. 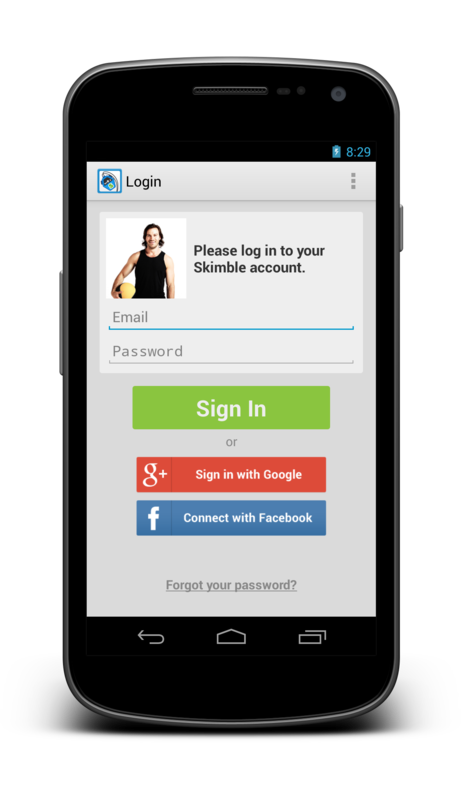 Get PRO+ in our Workout Trainer app or upgrade on the Skimble.com website now! Skimble’s latest Workout Trainer update also includes even faster workout loading times so you can download them in advance onto your phone and do them when you are offline. That means you can get your ‘exercise on’ while visiting your relatives in the far corners of Nunavut over the holidays. After your workouts, you can browse our community forums, like & comment on posts, and use our new search functionality. Cheers! ??? 7 day FREE trial of PRO+, with access to all PRO features & programs! ??? Complimentary videos in Workout of the Week challenges. ??? Start workouts faster than ever. ??? Download workouts for quick access later. ??? Search the community forums. ??? Like & comment on forum posts.